A Smart addition to your system. Building a great mix is the goal of every front-of-house engineer. Fortunately, it’s a lot easier with the StudioLive 16.0.2 mixer because the included VSL control/editor/librarian software incorporates Rational Acoustics’ Smaart Measurement Technology™ Spectra™ module. Spectra includes both an RTA and Spectrograph that overlays the Main bus' graphic EQ. 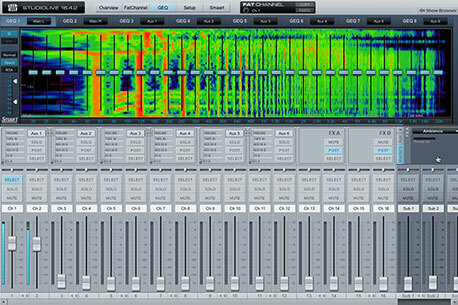 This makes fine-tuning your mix easier because you can see what your ears are hearing. Need to figure out what frequency is making your kick drum sound like a kickball? Using the StudioLive’s Solo In Place feature, you can view the frequency response of just that channel. Best of all, you don’t need an engineering degree to use VSL with Smaart! Learn more about Smaart. Why choose the StudioLive 16.0.2 rather than the StudioLive 16.4.2, 24.4.2, or 32.4.2AI? The StudioLive 16.0.2 is much lighter and more compact than the other models, and it's considerably less expensive. And although you cannot cascade two 16.0.2s to make a larger system, as you can with the larger models, you can cascade a 16.0.2 with any FireStudio-series interface for additional recording inputs. The StudioLive 16.0.2 also has a very cool feature that the larger StudioLives don't offer: MIDI control over main output level, effects levels and routing, and Scene change.